Sea Ice News #33 | Wott's Up With That? “Sea Ice News #33“. Anthony Watts tells us that the ice is coming back. Global Warming is over! Too bad the trends haven’t actually changed. Still, keep talking about it. If you really want Sea Ice News, go to the National Snow and Ice Data Center and ignore Anthony’s spin. Figure 3. 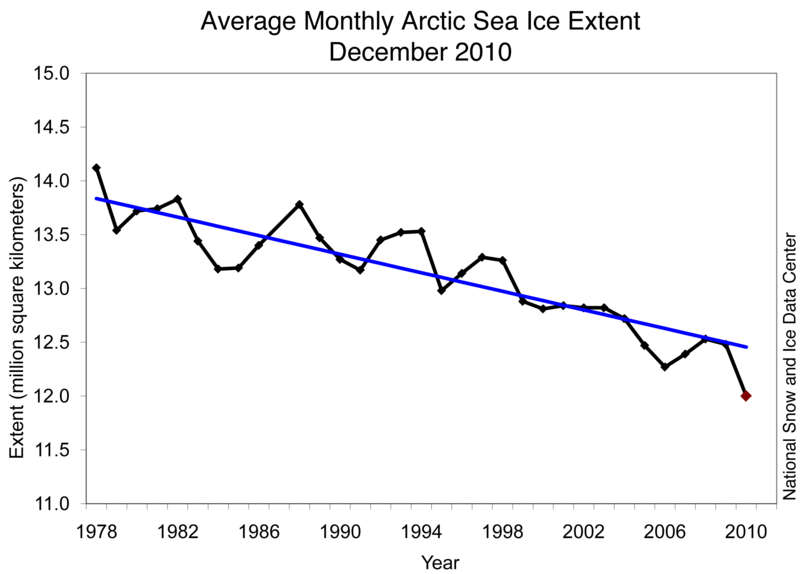 Monthly December ice extent for 1979 to 2010 shows a decline of 3.5% per decade. Credit: National Snow and Ice Data Center. This entry was posted in Just Keep Saying It and tagged Sea ice by Ben. Bookmark the permalink. Now that science has come to a better understanding of exactly where the “Arctic” is the ice is doing just fine! When a post contains the phrase “I’m repeating it here verbatim” it generally means there’s bad news ahead from a “There’s nothing happening and it’s all caused by the sun and the oceans” perspective. That of Hudson and Baffin is not ‘unusual’. It is unique. Totally unique. Aside, Ben, I’ve become infected with your meme ‘It snows somewhere, thus disproving global warming’. Thanks! I think you will have to accept the credits entirely. I-know-who would never speak that elementary conclusion. So if the sea ice extent in the Arctic Ocean is allegedly increasing as Steve/Anthony claim it to be so. Everyone who matters, like large volumes of electorate, seem to take those extraordinary claims without checking the facts. Excuse many of them, I do, because they just don’t have the time, energy or education.